Almost every model railroad train set will come with instructions telling you how to connect power to the track, which is pretty straightforward. In short, you connect the 2 wires from the power supply via a Controller to the track. Many modelers connect the (-) to one side of the track as a “common” rail and the ( + ) to the other rail. Keep in mind that this should not be done when using multiple boosters in DCC controlled layouts. Trains operate when electric current flows from the power supply to the motor in your locomotive. The medium used to transmit this current is the track itself, wire of various sizes, terminal section and/or terminal joiners. 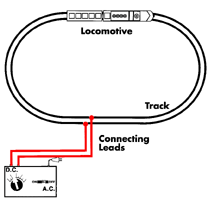 Electrically, the rails act as two wires to carry current to the locomotives. Because the rails are large compared to actual wires, they are adequate for carrying this current. Since layouts are made with more than one piece of track, rail joiners must be used to connect track pieces. Metal rail joiners hold two opposing rails in alignment and carry the current from one rail to the next. To prevent loss of voltage, the joiners must be clean and fit tightly on the rail. Model railroads operate on low voltage for safety reasons. Typically N and HO/OO Locomotives need a power source of 12V DC. In addition, you need a way to control the output voltage to the track to control speed, as well as means of reversing the polarity on the rails to control your locomotive’s direction. A power pack combines all these elements in a single unit. The power pack is the device which plugs into the normal 110/220V wiring in your home, has a throttle to control speed, a reversing switch to control direction and two output terminals which connect to the track. It also contains a transformer to lower your home’s 110/220V to 12V and a rectifier to convert AC to DC. Better power packs contain overload protection such as circuit breakers, which prevent a short circuit on the track from damaging the power pack. In addition to a variable DC output, power packs have a constant-voltage AC output terminals to supply power to operating lamps, switch machines and other accessories. This allows your accessories to receive the proper amount of power, regardless of the setting of the throttle. Since some accessories require considerable current, especially switch machines, (except for temporary set-ups or very small layouts), it is better to provide a separate AC transformer to power accessories. That way, a sudden demand for current, as when a switch machine is thrown, will not affect your train’s speed. Today’s power packs come in many sizes and varieties. They can be single units for one train or may have dual or multiple controls for two or more trains. In general, a separate power pack for each locomotive is best and that’s what we will show throughout this book. I really do not want to say too much about wiring as there are already too many websites that go into a lot of detail on the topic. However, should you request, I may just add more on the topic..